Boston is a city tied to a great deal of important American history. Glimpses into its past and former residents can be accessed by visiting one of its many cemeteries. 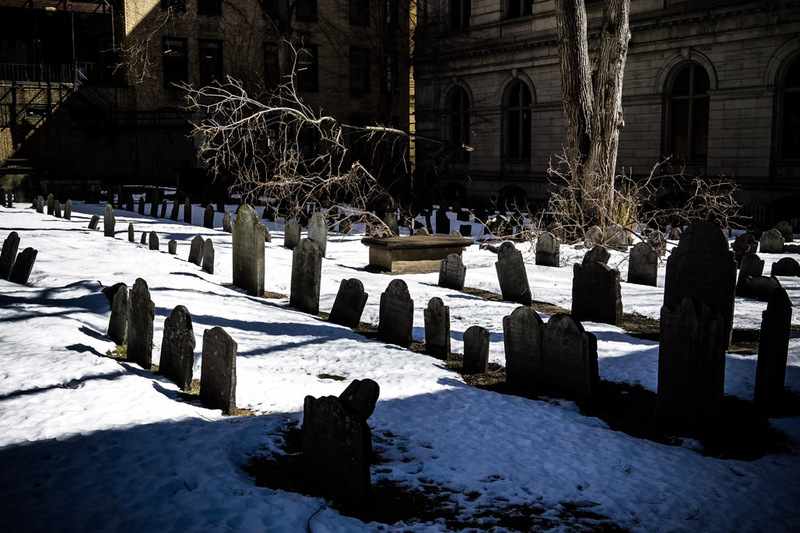 Within the heart of Boston’s city center lie three very different cemeteries, each with their own haunted tales. 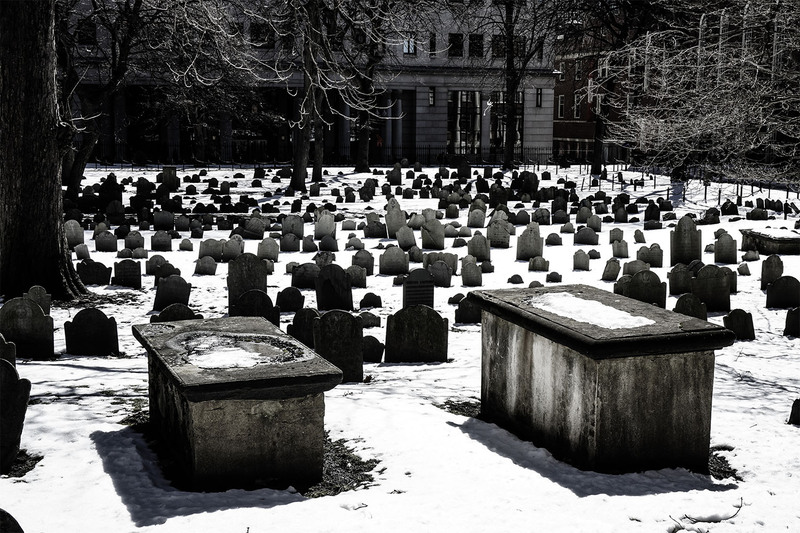 These are the ghost stories behind Boston’s most haunted cemeteries: The Central Burying Ground, King’s Chapel Burial Ground and the Granary Burial Ground. 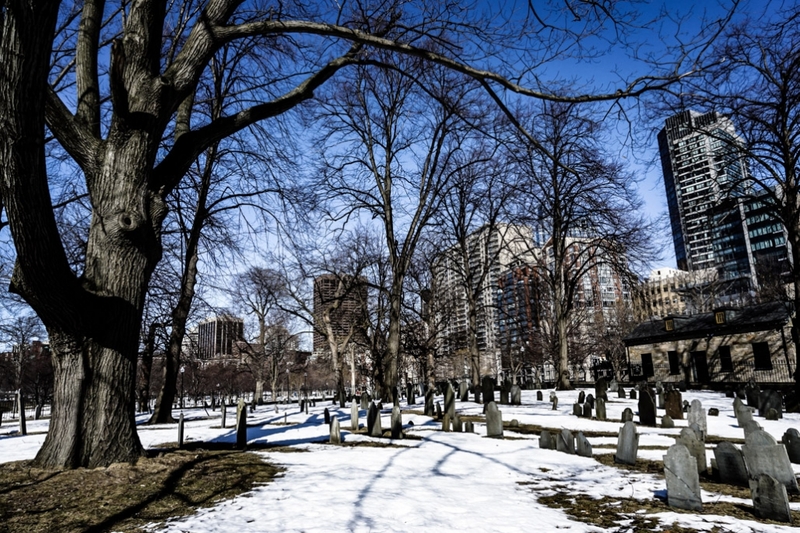 Strolling through Boston’s most haunted cemeteries. The Central Burying Ground is large and poorly maintained. It doesn’t quite fit into the city and its surrounding park land and has been treated as such. The cemetery is filled with some of Boston’s poorest individuals from the 19th century, unlike other nearby burial grounds that house notable figures. This was taken as an invitation by the city to disturb the dead who were attempting to rest within its grounds to form new roads and a subway station. Corpses and remains were dug up and moved to a mass burial plot, moved to other locations or simply built over. Many now believe that this display of disrespect for the dead is the reason why the Central Burying Ground is so haunted. Pathway forged through the snow in the Central Burying Ground, Boston. 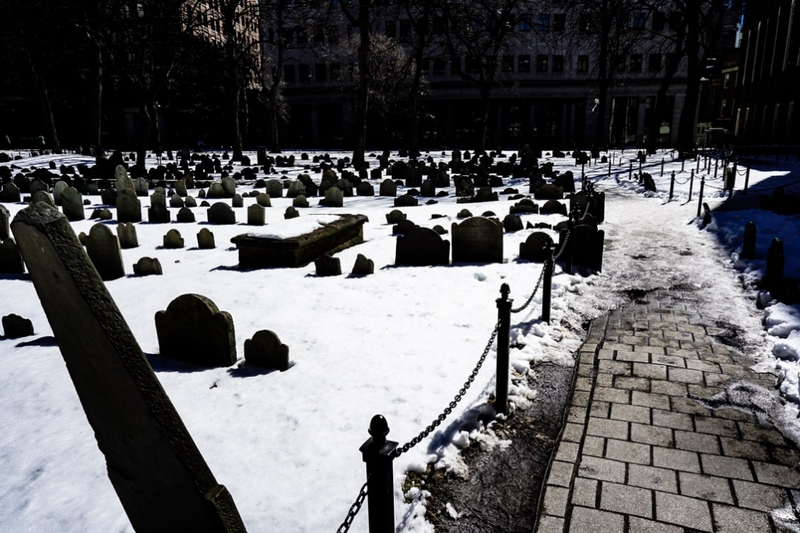 The Central Burying Ground is said to be haunted by former Boston residents buried there who have had their peace disturbed. 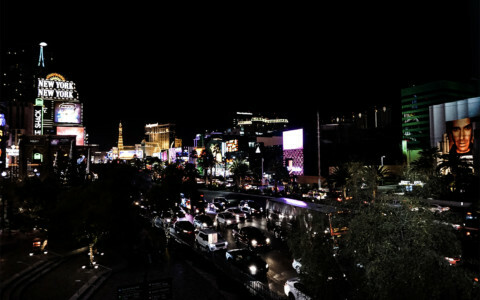 It is common for visitors to feel an invisible presence around them whilst walking through the area. Many reports of unexplainable light anomalies, orbs and voices have also been made here. Broken tombstones inside the haunted Central Burying Ground of Boston. A young girl is rumored to haunt the grounds. She manifests herself to visitors wearing a tattered white dress and follows them as they walk through the graves. She is said to watch visitors and stay within their eye sight, no matter where they turn to look. She has even been known to grab those brave enough to enter the graveyard with her small, ice-cold hands. City skyline next to the Central Burying Ground in Boston. You’ll find the Central Burying Ground at Boylston Street (between Charles and Tremont Street), Boston, MA. 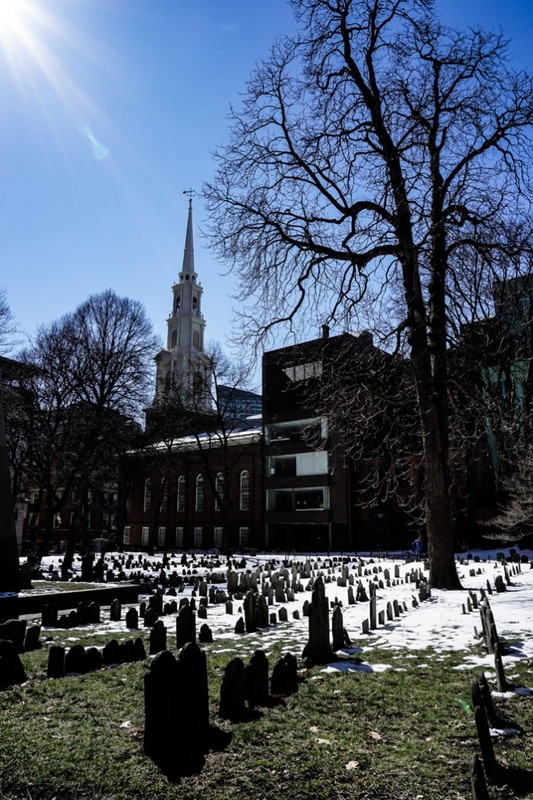 Founded in 1630 King’s Chapel Burial Ground is Boston’s oldest cemetery. 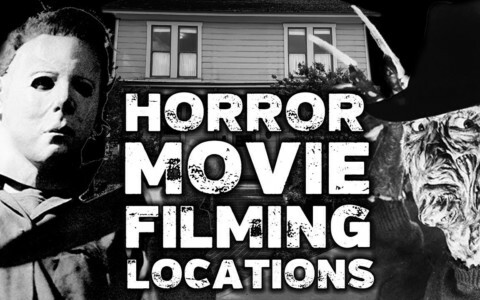 It is a favorite stop on ghost tours and for paranormal investigators, with good reason. 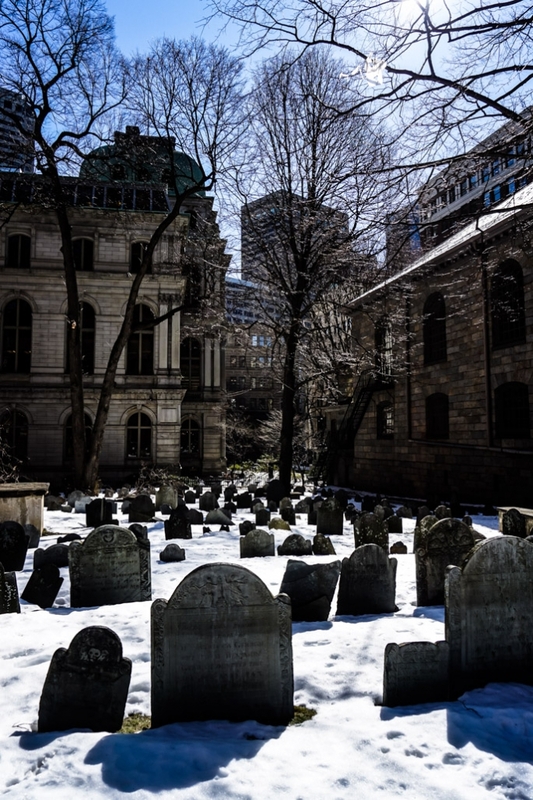 It holds the bodies of many noteworthy individuals who were important figures in early Boston, has a couple of resident ghosts and features in some pretty grizzly tales. 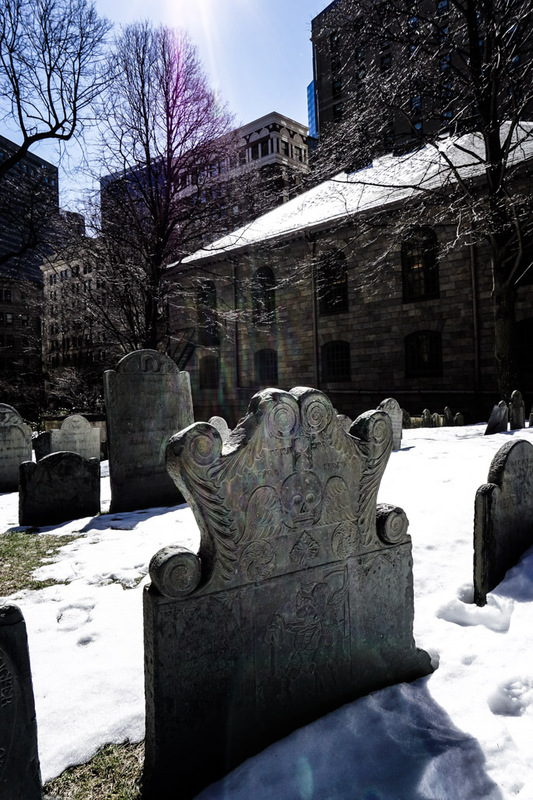 Sun shining down on the haunted and snow covered King’s Chapel Burial Ground in Boston. Perhaps the best-known ghost story to come out of the King’s Chapel Burial Ground relates to Captain Kidd. Kidd worked for the Government in the late 1600’s as a sort of pirate hunter, seeking out and capturing anyone who was involved with piracy. In 1700 the tables turned after rumors lead Kidd to be arrested himself for piracy. He was put to trial in England, found guilty, hanged and then his body was supposedly returned to Boston where it was buried within the King’s Chapel Burial Ground. Since Captain Kidd’s death many have claimed to have seen his apparition and heard his voice within the cemetery. The most ornate tombstone within King’s Chapel Burial Ground, Boston. Other interesting ghost stories about the King’s Chapel Burial Ground exist. These include that of a headless woman. Legend states that a carpenter had created a coffin too short to house the body of a woman who was to be buried. As a ‘short cut’ to avoid further work it is said her head was chopped off and placed in between her legs to fit her easily within the coffin. To this day many have claimed to see a headless woman wander the cemetery. Another gruesome tale describes a man who was buried alive within the graveyard. His body was exhumed but by the time he reached the surface he had suffocated to death. His spirit is also said to wander aimlessly throughout the cemetery. Rows of gravestones inside the haunted King’s Chapel Burying Ground. 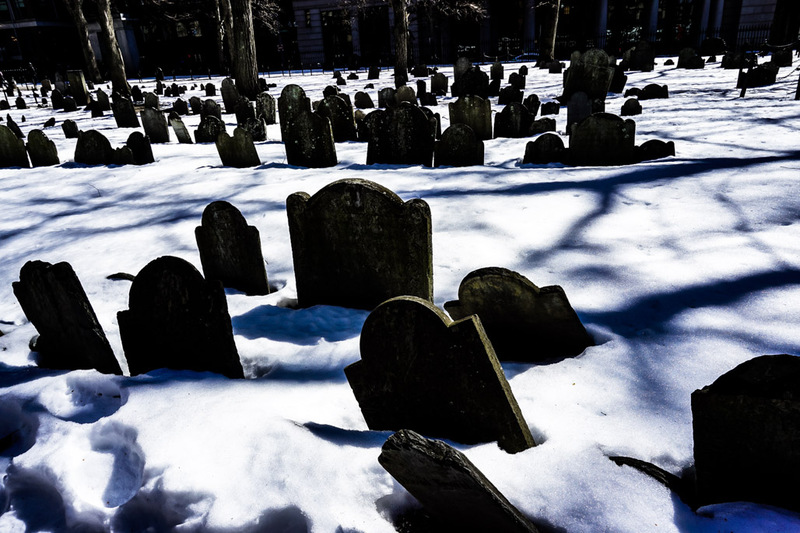 In addition to these specific ghost stories, light anomalies and disembodied voices are often reported by visitors to the King’s Chapel Burial Ground. You’ll fine the King’s Chapel Burial Ground at 58 Tremont St, Boston, MA. 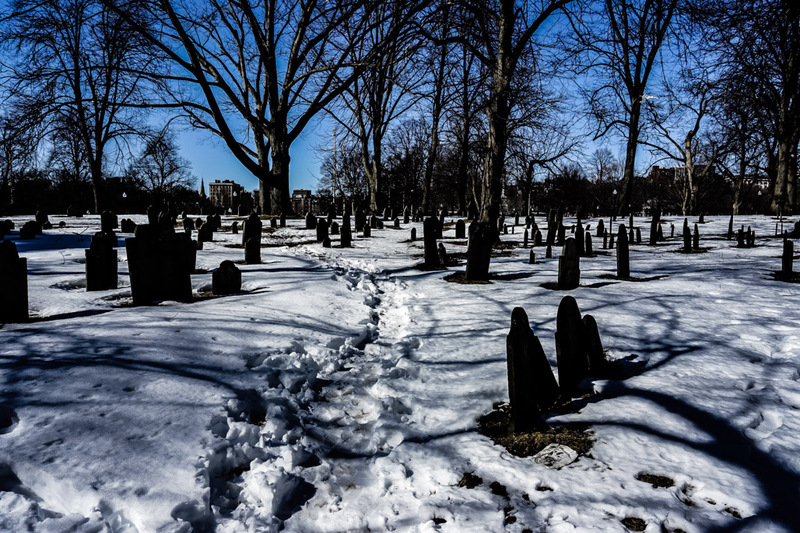 The Granary Burial Ground is likely Boston’s most visited cemetery and one of the most haunted spots in the city. It is of great importance to the city’s heritage and acts as the burial place for many notable individuals of historical importance. It holds patriots who signed the Declaration of Independence, Benjamin Franklin’s family and many Governors. 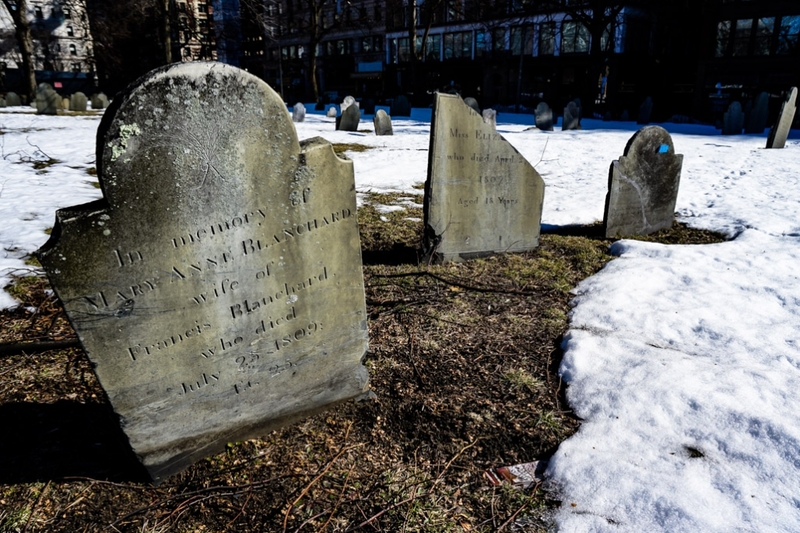 Inside Boston’s most haunted cemetery, the Granary Burial Ground. Incredible amounts of paranormal activity have occurred within the cemetery, which has accumulated approximately 5000 bodies since opening in 1660. People claim to have sighted shadow figures, apparitions, floating lights and orbs within the cemetery. Some have even managed to capture what they believe to be ghosts in photographs taken in the area. Paranormal investigators have also had success with recording EVP’s and documenting changes in electro-magnetic fields around the cemetery. Bent gravestones in the Granary Burial Ground Boston. 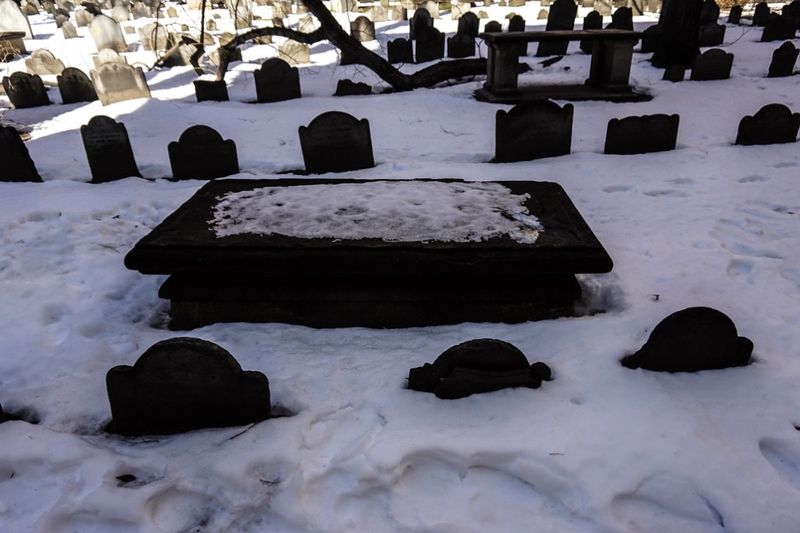 The Granary Burial Ground’s best-known ghost story features a reputable lawyer, named James Otis Jr. Legend states that James was struck over the head with a bottle during a bar fight with another lawyer. This caused him an injury that severely affected his mental capacity, causing him to slump into a deep depression. It is told he had written a letter pleading for God to take him from this life in a flash of lightning. Coincidentally, James was struck down by lightning and killed soon after. His body was then buried within the Granary Burial Ground, where his ghost is said to now linger. Presenting himself to visitors dressed in Colonial style attire. 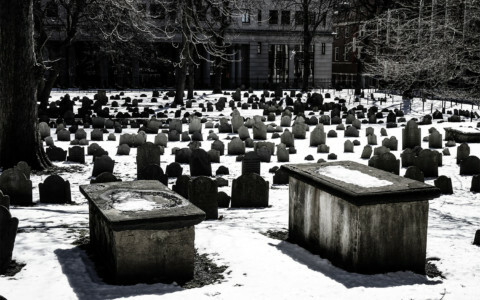 The Granary Burial Ground is one of the most haunted places in Boston. You’ll find the Granary Burial Ground on Tremont Street (between Park and School Streets), Boston, MA. Boston is a great city to explore for those with an interest in early American history. These cemeteries are all located within a short walk from one another and centrally placed within the city center. 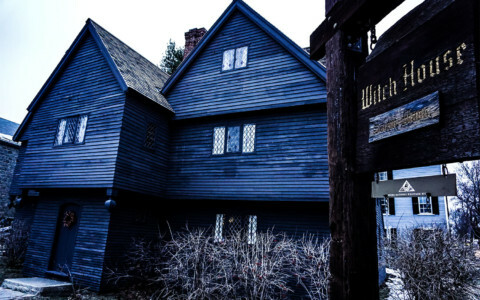 They are a must see for any one exploring Boston’s history, ghost hunters or macabre tourists. If you enjoyed this read and are looking for other spooky cemeteries to explore, check out this spooky cemetery in what is rumored to be the most haunted town in Australia.